Successful roof installation requires a little knowledge and planning which one can find in this guide. 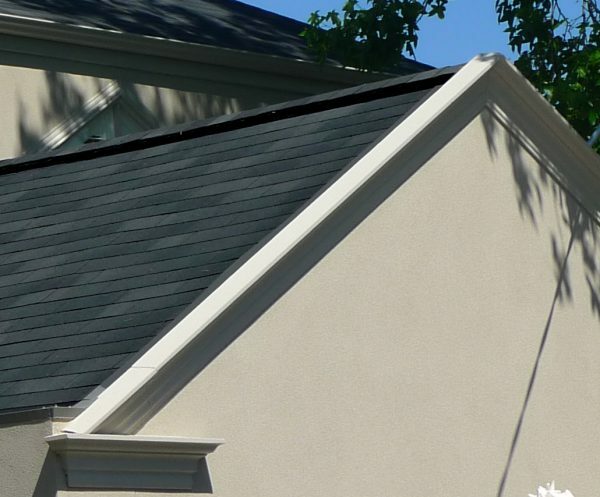 It is important to learn how to correctly install asphalt shingles. Follow the steps below and you will have a roofing system that will outperform most other roofs, easily outlasting the warranty period. Failure to follow any of the roof installation measures below may cause your materials to start to deteriorate before the Warranty period. For a worry-free roof read this guide and of course ring and speak to one of our roof installation team with any questions you have. 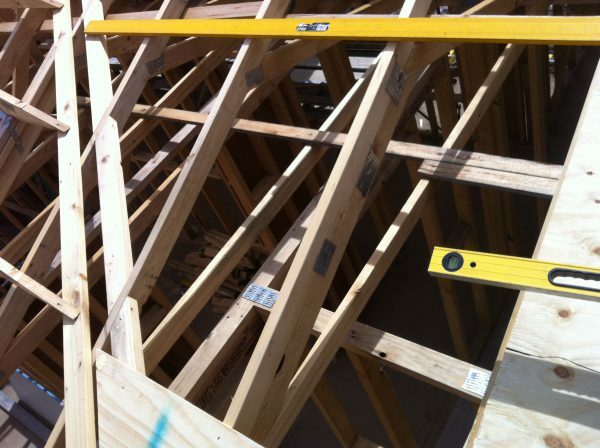 We generally start with the trusses “rafters” spaced at 600mm centres. 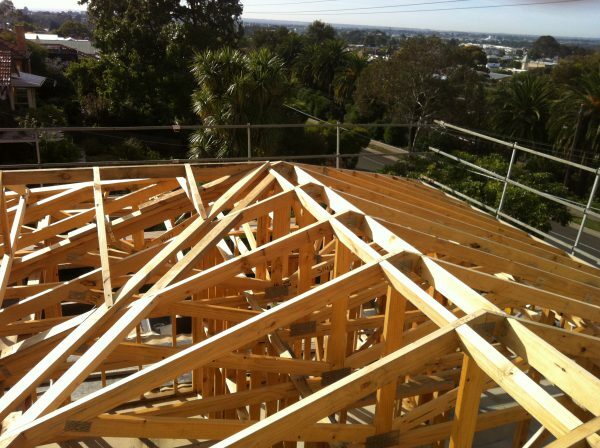 If rafters are at 900mm centres you will need to use 17mm plywood in 2700mm x 1200mm sheets as per Australian standards. Before we install the plywood we need to perform a few simple things. The centre valley line needs to be nogged to stop any movement in the plywood. If the ply can move in the valley the shingle roof tiles or rubber membrane can rip and water can enter. The ridge needs to be nogged 100mm back from the apex. This gives the plywood something strong to attach to and also provides support to the ridge ventilation and capping tiles. Pay special attention to the leading edge of the plywood above the fascia board. This is where we achieve “Inlet Ventilation” around the entire perimeter. 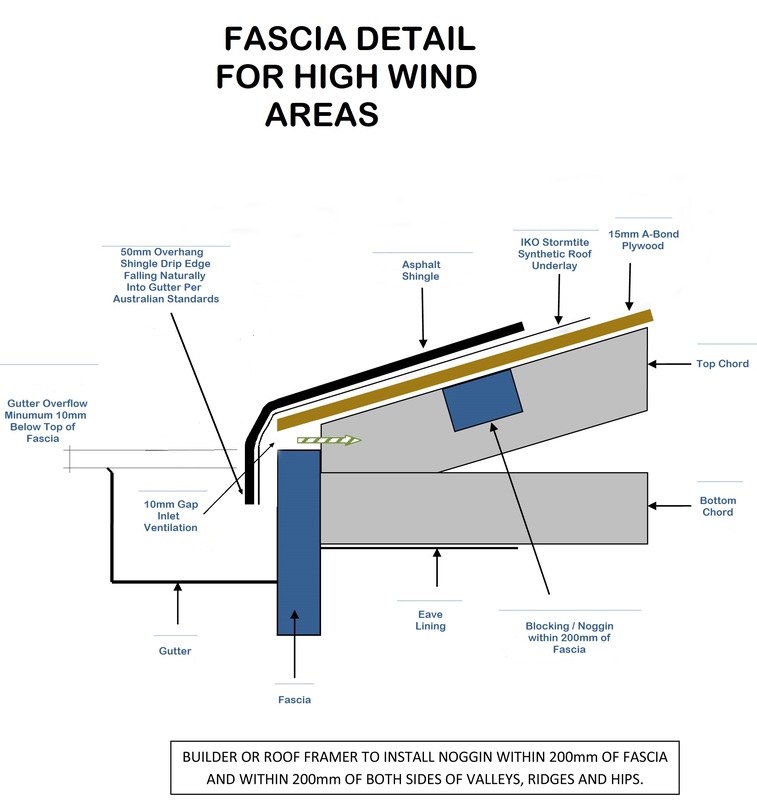 This detail above is an alternative method of installation in high wind areas which are extremely susceptible for shingle uplift in this area. There are other methods for installing asphalt shingles at the fascia in bush fire zones. Call one of our staff for advise. 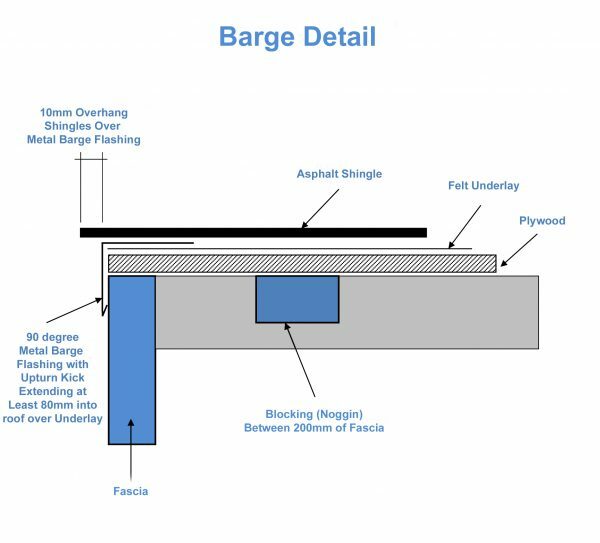 The section near the barge is detailed in the picture below. 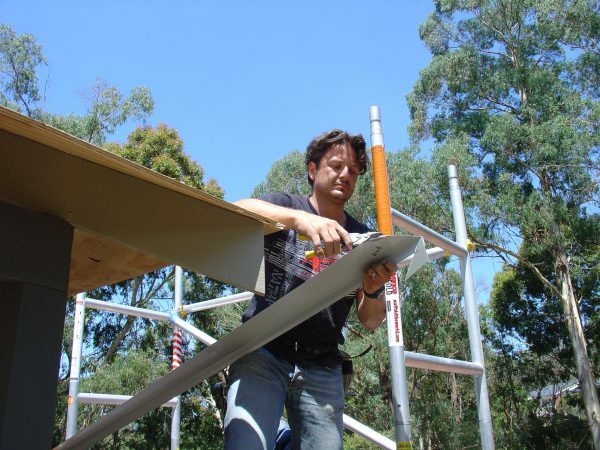 A shingle roof installation uses “Australian Made” 12mm A-Bond Tongue & Groove Structural Plywood – stamped (AS/NZS 2269). 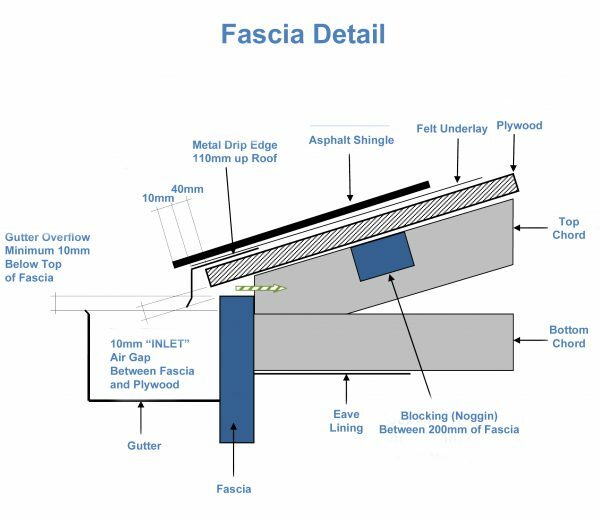 To install Plywood you will need to follow the manufacturers roof installation guidelines but generally speaking, 70mm long shank framing nails spaced every 150mm will suffice. This is also suitable in high wind zone areas. 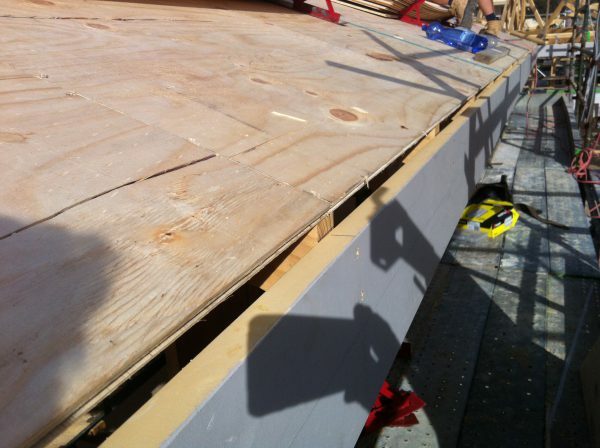 It is important to use tongue and groove plywood as it provides the stability needed under the felt paper and shingles. The tongue and groove edge should be butted together tight with the short vertical edge needing a 2mm gap for any expansion in the wood. We then staple down #15 Asphalt Saturated Felt Paper – holding it in place. We overlap 50mm on the horizontal joins and 100mm on the vertical joins. Between 8.5 degrees and 18.5 degrees pitch we either use a double layer of felt paper or Armourguard rubberized adhesive membrane to cover the plywood. On low pitches (between 8.5° – 15 degrees) we generally use an adhesive rubberized membrane material. This is because the water doesn’t flow down the slope as easily – wind-driven rain can flow up the slope and under the shingles. Asphalt saturated felt underlay is a 920mm wide felt paper with a coating of asphalt saturant. Underlay provides secondary protection from wind-driven rain. Most manufacturers require the use of underlay in the roof installation to validate the warranty. The use of underlay can flatten out any irregularities in the plywood base. A Class A fire rating will only be obtained with the use of saturated asphalt underlay. The minimum required standard for the underlay is No. 15 / ASTM D226 Type 1 felt. See CASMA Technical Bulletin No. 3 (1992) or ARMA Technical Bulletin Underlayment for more detailed underlay roof installation information. We then line the valleys with “IKO Armourguard” which is a thick rubberized membrane. This gives additional protection at the roofs most venerable area. Colorbond drip edge at the fascia is installed. At the fascia (bottom edge of the plywood) this should extend at lease 110mm up the roof. This flashing protects the bottom edge of the plywood from water damage – rotting. The barge flashing protects the plywood from water damage and keeps the water out. Install the asphalt roof shingles are with galvanized clout nails (10mm head and at least 25mm long shank) the nail should penetrate through the plywood by 2 – 3mm. In my experience, when I use staples to fasten shingles they slowly work their way out of the plywood over time. They tend to cut through the shingles above letting the water penetrate. Position the clout nails just below the glue line and above the cut out strip on Marathon roofing shingles and on the Cambridge Laminated shingles follow the line. The clouts must be flush with the top of the roofing shingle as per the diagram above. 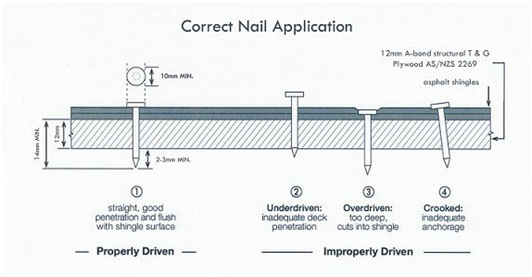 The nail should pass through the plywood deck by 2 – 3mm as recommended by the ARMA. See ARMA Form No. 221-RR-93 (1994) for more information. 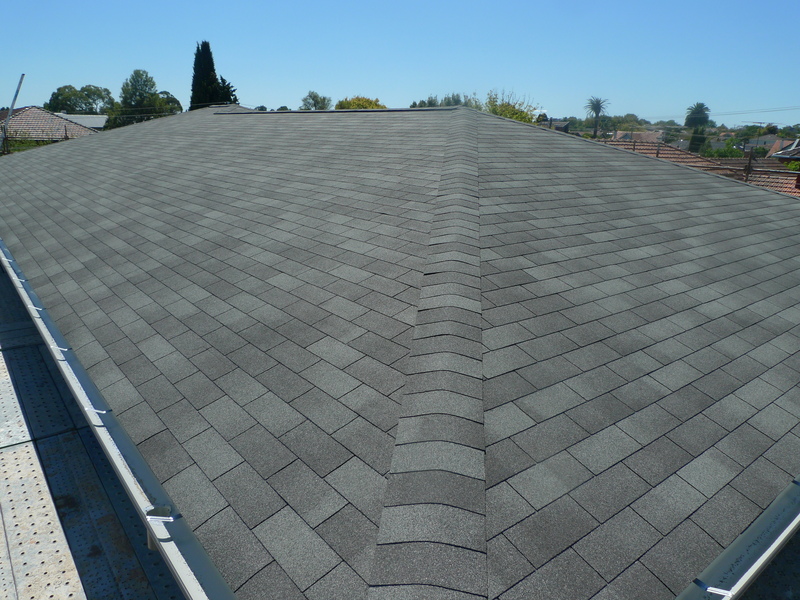 In high wind zones it is advisable to install asphalt shingles with a six nail pattern. This provides additional holding power. 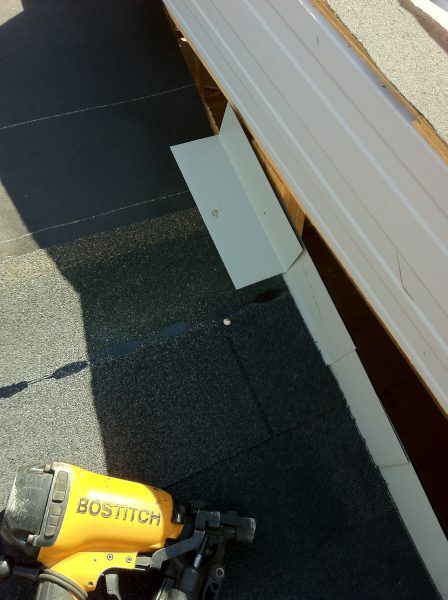 Above 60 degree pitch you would need to manually glue down each shingle tab with asphalt mastic. 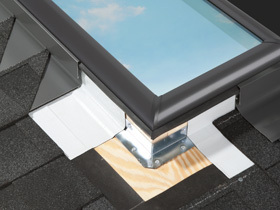 You can purchase Velux skylights with a step flashing kit to be used with asphalt shingle roofs. You will need to ask when purchasing. 1000mm of ridge ventilation is equal to 1 x “whirly bird” ventilator. Ridge ventilation is essential for adequate exhaust ventilation. One can use box vents but they provide very little “Net Vent Area” so a standard size roof may need 20-30 box vents which is not very practical. Probably the most important installation consideration is proper ventilation. The size and design of the roof determine the necessary amount of ventilation. For attic spaces above an insulated ceiling, the vent ratio is one square meter of net free ventilating area/300 square meters. For low slope roofs or cathedral ceilings, the vent ratio is one square meter/150 square meters. First, hot air naturally rises and exits out of the ridge vent, pulling in cool air from below. Second, positive airflow across the ridge of the house creates a “venturi effect”, or a negative pressure, which pulls air out of the ridge vent and brings in cool air from the Inlet air gap created. In calm or windy weather, a constant flow of cooler, dryer outside air vents the entire attic. 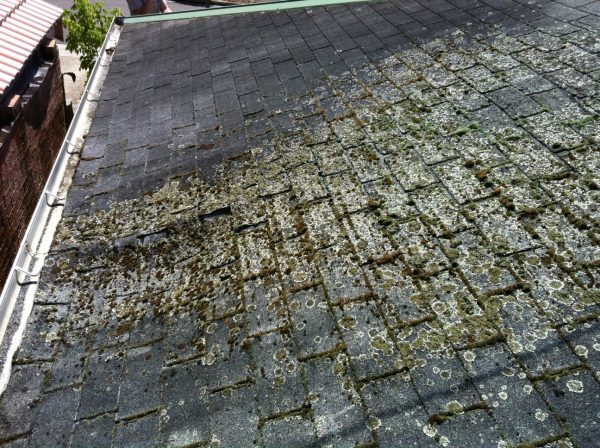 Here is an example of a “completely sealed” asphalt shingle roof. It has no ventilation, no underlay, and the bathroom exhaust is venting into the attic space. The plywood was not tongue and groove and there was no drip edge. What looked like household staples fastened the shingles. As you can see it was a mess. See CASMA Technical Bulletin No. 1 (1992) or ARMA Form No. 209-RR-86 (1994) for more information. The best form of ventilation is a premium ridge vent. The vent we use is the Trimline premium ridge vent. The correct use of ventilation plays a number of roles. It regulates the air temperature inside the roof area keeping it the same as the outside air temperature or at least +/- 10 degrees. In attics which do not have a proper ventilation, simple condensation creates moisture. The air inside an improperly vented attic will be warmer than the air outside. When this warmer, moist air comes in contact with the colder roof sheathing condensation will occur. In effect, it can actually “rain” in your attic. Stops buckling of roofing shingles due to deck movement. Stops premature failure of the roofing including blistering. 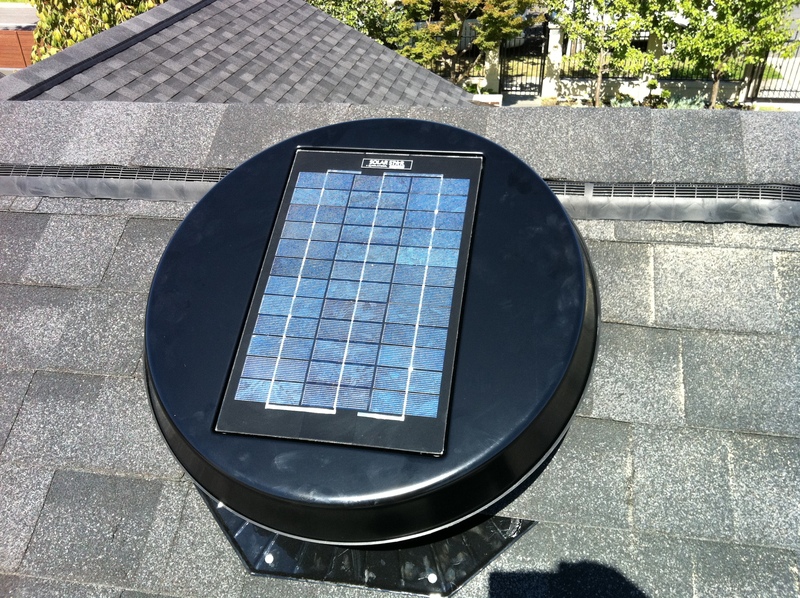 In roofs where there is a small amount of ridge, it may be necessary to install a solar-powered roof vent. These exhaust the equivalent of 12 spinning ventilators and only operate in daylight hours. This means they take the heat out during the day and leave the heat in the roof space at night. I have provided a lot of information for you to take in however if you fail to understand or your builder doesn’t follow these steps you might find yourself without a manufacturer’s warranty and with a roof that needs replacing after only a few years.